This is a 2011 arrival, a 3.1 oz, 3.12” by 31.1” by 0.9” smoky tangerose quartz, deftly twinned and from Corinto, Brazil. These were isolated to a single find among tangerine quartz there, except rather than that juicy orange color, they were shades of coral and rose. Hematite, in its wondrous flexibility of expression, has altered their energies. The mines have been pretty well played out, so imagine my surprise to open this special box of what I call ‘smoky’ tangerose quartz! She isn’t actually smoky, but is smoky colored. 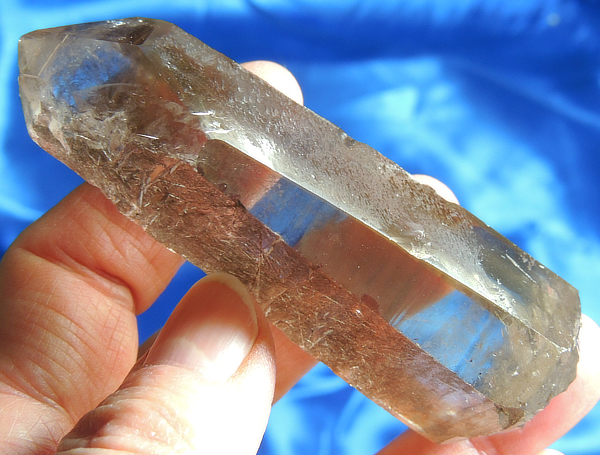 Normally smoke color arises from exposure of white quartz to natural radiation within the earth. Her color is derived instead from hematite … the same thing that gives her that awesome tangerose color! And look at all the amazing starbrary glyphs – lightning, star charts, meteor storms, alien landscapes, including some very hard to show as they are a slight textural change! Now, she isn’t as marked as some, but the glyphs are very interesting and meaningful … sometimes less is more! She is like a starbrary on steroids … you simply will not believe the quantity and diversity of what you see! She has a few very minor dings, but these don’t affect her regal beauty or intense energy in the least! I am amazed by the ancientness of the energies emanating from this Spirit. She touches a cord deep within your soul that joins you to All That Is, instilling a deep sense of belonging. There is no need to worry or stew over what your role is – you know it without verbalizing in any manner. You are embraced in every sense by a sweetness and freshness that renews the Spirit and heals the Self. During meditation several summers ago, I perceived a color to the Earth’s aura that I called ‘resin’ – it was a honeyed rose with a fragrance of tuberose or honeysuckle. The color and the odor were defined together – you couldn’t sense one without the other. And this Spirit is of that vibration – to work with her is to know the Earth in all its intimate stages, including the visitors from the stars. This is a rare twin flame, useful in finding your soul mate, but also in finding your true beginnings … your true inner heart. Although many starbraries need companion crystals to unlock the messages, she will openly reveal hers to the right Keeper. She is a rare and wondrous Spirit!